The elite unit of US Navy SEALs, which killed Osama bin Laden inside Pakistan, had a specially-trained explosives-sniffing dog for the surgical strike. The commandos, numbering 79, brought along the military dog for the covert operation at bin Laden's compound in the garrison town of Abbottabad on Sunday, according to US media reports. 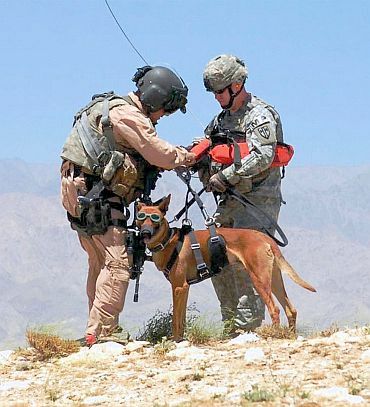 The fearless four-legged recruit was strapped to an assault team member during the operation in which the special forces lowered themselves down ropes from the helicopters to storm the Al Qaeda leader's secret lair. It is unclear what the role of this particular canine was in the 40-minute helicopter raid but he was probably there to sniff out explosives, detect weapons or even apprehend fleeing suspects. 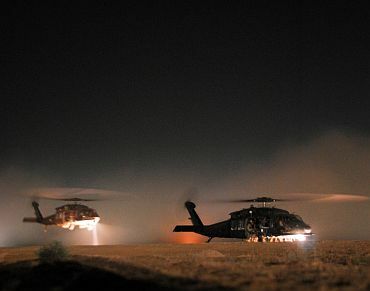 The dog used in the US raid would have run down the 9/11 mastermind if he had tried to escape, according to the reports. The breed of the dog who has not been named was not known and he seems to have been unharmed in the operation and left with his team-mates. 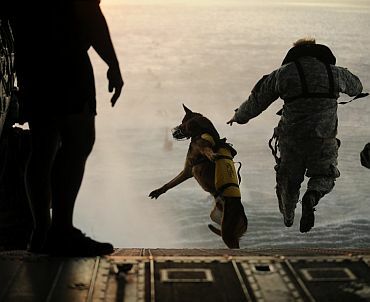 The identity of the military super-dog, like that of the 79 Navy SEALs will remain a secret. But experts say the canine is either a German shepherd or Belgian Malinois -- breeds the US army believe have "the best overall combination of keen sense of smell, endurance, speed, strength, courage, intelligence and adaptability to almost any climatic condition", according to a military fact sheet cited in the New York Times. In the Abbottabad compound raid, the dog was equipped with protective body armour before rappelling onto the ground from a hovering helicopter in a support harness attached to its handler, according to the media reports. This particular dog was known for its bomb-sniffing prowess and The Daily reports it was trained to "sniff out enemy troops from up to [3km] away". The German and Belgian shepherd dogs can run twice as fast as humans, so if bin Laden tried to escape on foot the dog could have stopped his getaway, the Atlantic reported. The most commonly used breeds in the US military in Pakistan and Afghanistan are the German Shepherd and the Belgian Malinois. These dogs are typically well-protected, wearing body armour and infra-red night sight cameras. They're valuable dogs, well-trained and highly effective. The US is believed to have more than 500 dogs in service in Pakistan and Afghanistan. According to the US Air Force, the bite from a German shepherd, one of the breeds used by the military, has a force between 400 and 700 pounds. 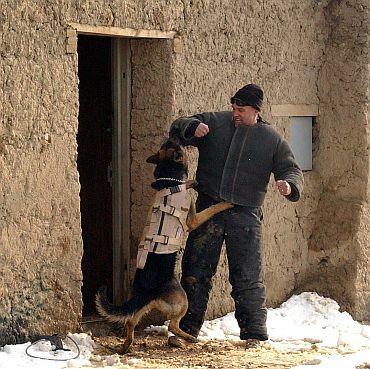 Military dogs go through rigorous training that is just as demanding as what human troops go through. Last year, at a cost of more than $20,000 per unit, the SEALs bought four tactical vests for their dogs, according to The New York Times. The vests are reported to have infrared and night-vision cameras that allow handlers to use a monitor from up to 1,000 yards away to see what the dog sees. The handler is also able to communicate with the dog through a speaker on the vest. General David Petraeus, Commander of US forces in Afghanistan, has in the past hailed the capabilities of the dogs, describing them as highly reliable and totally irreplaceable. 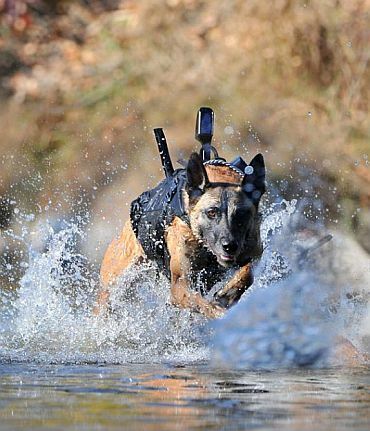 "The capability they [the dogs] bring to the fight cannot be replicated by man or machine," according to Petraeus. "(Dogs) can sense biological, chemical, or radiological nuclear or explosive elements in the air better than security technology can, like sensors, drones, like UAV's, these types of things," Halo Corporation President Brad Barker was quoted as saying by the US media. He said these dogs train much in the same way their two-legged SEAL counterparts do and jump from helicopters right along with them. As for their gear, they're heavily armoured and ready to hit the ground running. "Bullet-resistant vests that can stop a blade, can stop a bullet, they get helmets on them to increase their survivability, night vision goggles, thermal imagery," he said. The dog on the bin Laden mission was there to detect explosives. Their ability to get into confined spaces and send back live video of interiors of buildings is crucial to let teams of SEALs know when it's safe to enter, ensuring the mission's success. "It takes a special dog with special breeding, a tremendous amount of patience from a handlerm and then still only a select few make it to be SEALs best friend," Barker said. "By all measures of performance, their yield outperforms any asset we have in our industry." US Military has actually taken the services of dogs since the Civil War days. 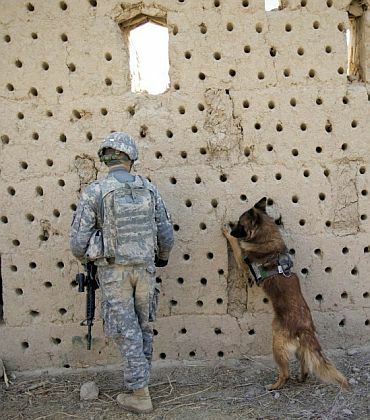 Currently, the US Army has an estimated 2,800 dogs working to detect IEDs and helping soldiers out on the battlefields. 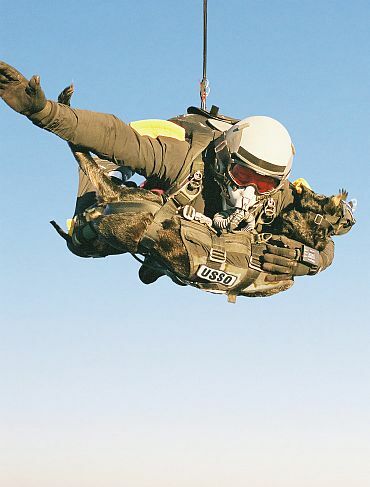 The military dogs are a fighting force on four legs that are able to parachute into action, rappel into combat and swim into a skirmish. They are outfitted with protective body armor and a powerful bite. 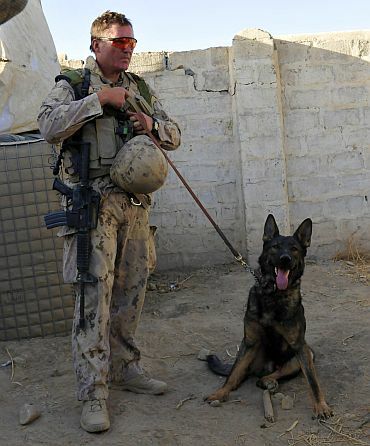 The war dogs wear ballistic body armour that is said to withstand damage from single and double-edged knives, as well as protective gear which shields them from shrapnel and gunfire. Wearing oxygen masks, the pooches have been trained to jump from aircraft at 25,000ft, before seeking out insurgents in hostile environments. The animals will attack anyone carrying a weapon and have become a pivotal part of special operations as they crawl unnoticed into tunnels or rooms to hunt for enemy combatants. The cameras on their heads beam live TV pictures back to the troops, providing them with critical information and warning of ambushes. While its bite may be impressive, it is a military dog's exceptional ability to detect bombs that makes it indispensable to soldiers, experts said. "They've spent millions of dollars trying to come up with the best bomb detection technology," said Rebecca Frankel, deputy managing editor of foreignpolicy.com, who writes "War Dog of the Week" for the site.